I’ve decided I’m going to go neighborhood by neighborhood, chronicling all of the delicious and not so delicious treats I consume along the way. One of my favorite neighborhoods in NYC is the East Village. It is defined by Wikipedia as, “the area east of Broadway to the East River, below 14th street and above Houston” (pronounced How-ston for all you out of towners). 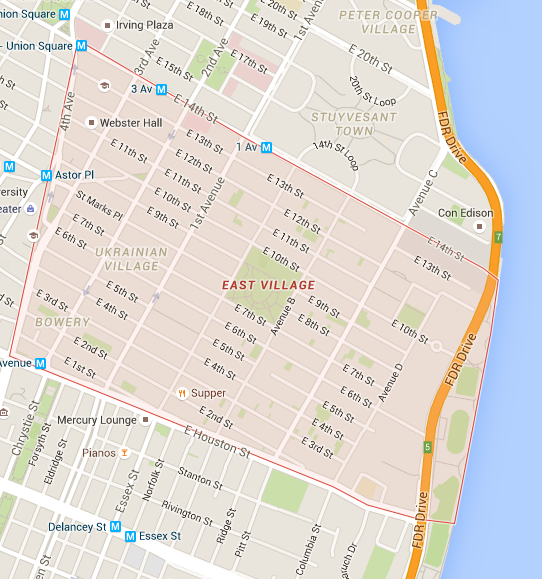 Im just going to include Alphabet City in the East Village scenario because Wikipedia says I can. Noho, which is kind of, sort of in the East Village, has so many good restaurants in those 5 tiny square blocks or so that it deserves its own post (Gemma, I am coming for you in my next post <3). 1.Momofuku Noodle Bar (E 11th & 1st) – In the past three weeks, I have been to Momofuku 5 times. I cannot get enough of this place. I tell everyone I meet about it and can’t stop raving. I have only tried 3 things on the menu (4 including the beer), but I cannot bring myself to deviate from the deliciousness I know awaits me when I walk through their doors. I recommend going on a super hot day because the line is always short haha but they keep the AC on so high you don’t even notice the sweltering heat with your warm noodles. You really should check this place out. Get the Ginger Scallion Noodles – THEY ARE EVERYTHING!!! What I eat: Ginger Scallion Noodles (pictured above), Brisket Buns, Shitake Buns. 2. Supper (E 2nd & A) – I will go as far to say, this place serves the best bowl of pasta in NYC. 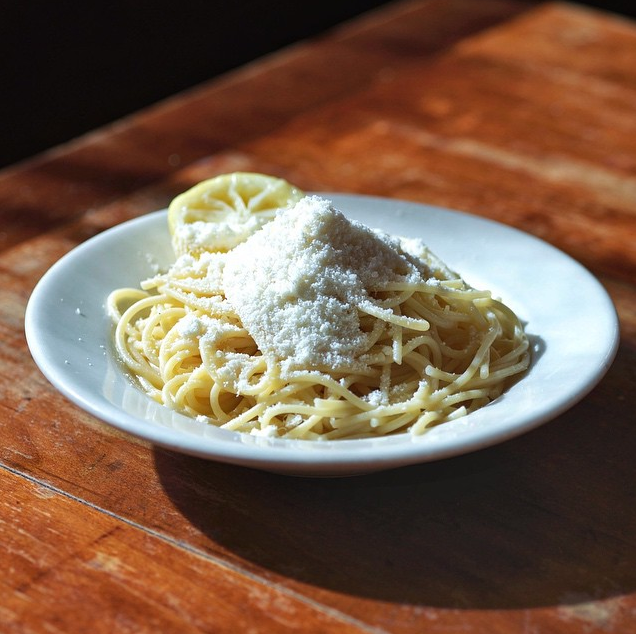 During the summer, their Spaghetti al Limone (spaghetti with parmesan, lemon and butter) is the most refreshing & delectable dish you will ever taste. I arranged a Bachelorette party there and made everyone try this dish, they were all raving about it and it was gone in 5 seconds. Start off with a bottle of wine and a salad, feast on their complimentary bread with the heaven of all bean dips, and finish your meal with the best freaking pasta on planet earth. What I eat: Black Kale Caesar, Spaghetti al Limone (pictured above). 3. Mimi Cheng’s Dumpling House (E 12th & 2nd) – This place has been on my so called “NYC Foodie Bucket List” for the past three years and I finally made it over to this cute little joint this weekend. It did not disappoint. Their seasonal special was a cheeseburger dumpling, so naturally I sampled that and their classic option. I walked out of there happy as a clam. Make sure you try the secret sauce, it was so good I wanted to drink it, take it home with me and put it on every meal I make. What I eat: Seasonal Special – Cheeseburger (pictured above), The Mimi Cheng (pork & zucchini). 4. Mermaid Inn (2nd & E 6th) – This place is renowned for their Happy Hour. My friends and I frequent this place at least once every other month to take advantage of their insane deals. $1 oysters, $5 beers, half price appetizers, we walk out of there feeling full and happy. One thing not on their HH menu that we get every single time…their Old Bay fries. I could eat them by the bucket load. Fair warning, this happy hour is not for the weak. You will consume so many glasses of wine and so many oysters, that you will stumble all the way home – it will be worth it. 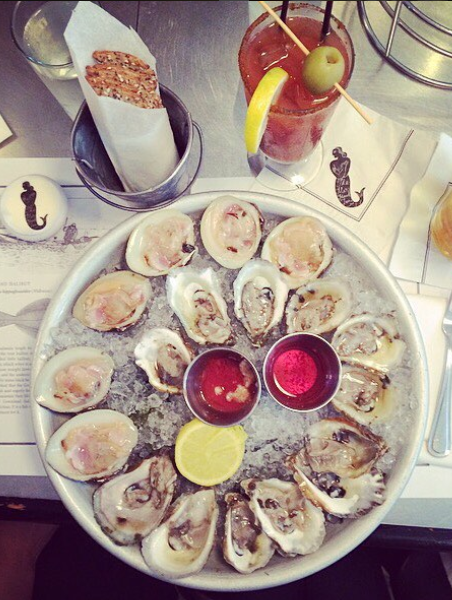 What I eat: Oysters (pictured above), Fried Calamari, Old Bay Fries, Lobster Roll. 5. 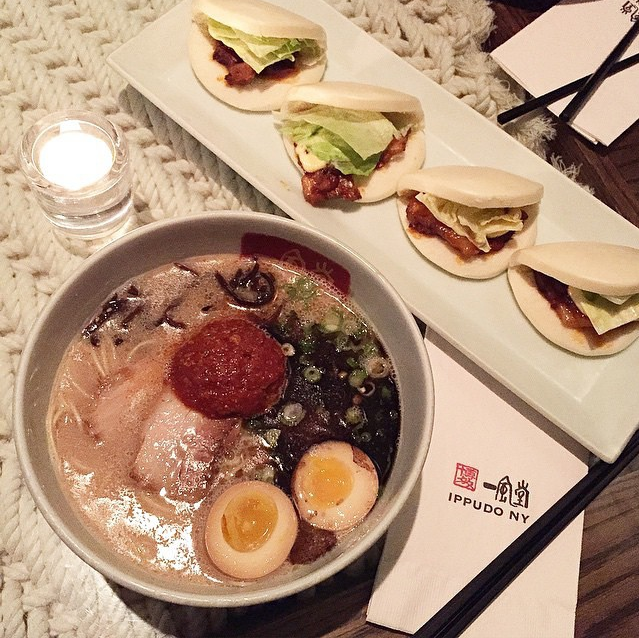 Ippudo (4th & E 10th) – All hail these mighty pork buns. Yes, the wait may be insane, but the handy little app they have shows you how long until your table is ready. This allows you to pop into one of the many near by bars for a drink, while you wait for the heaven that is coming your way. I recommend sitting at the counter. This way you can witness every single thing going on and salivate over every dish that passes your way. What I eat: Pork Hirata Buns, Akamaru Modern Ramen, Wasabi Shoyu Ramen. 6. 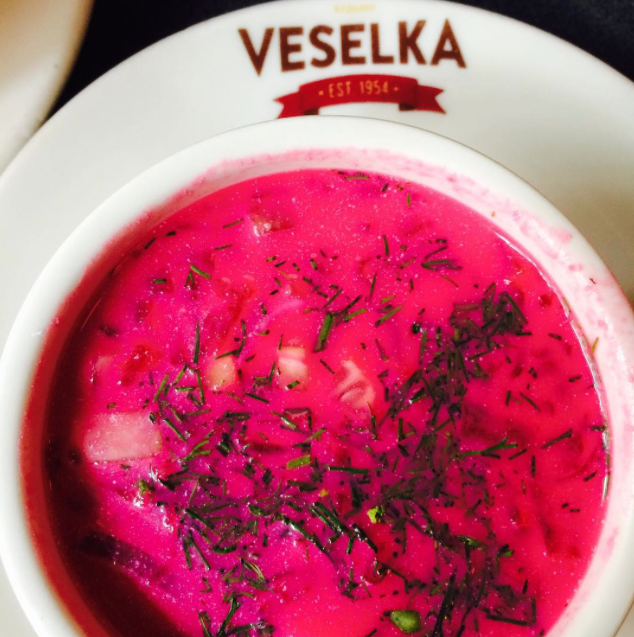 Veselka (E 9th & 2nd) – Pierogis, pierogis, pierogis oh my. SO GOOD. One of my friends from home is part Polish, and I remember going to her house in 2nd grade and feasting on these little bites of cheese and potatoes. So naturally, in the city that offers every type of cuisine known to man, there was bound to be a delicious Polish spot…and I found it (along with every other New Yorker apparently). Veselka is a cute little spot that offers so many delicious options. Not kidding, their menu is huge. I recommend getting a plethora of options for the table to share so you can try everything. What I eat: Cold Borscht, Potato & Cheese Pierogi, Potato Pancake, Egg Noodles. 7. 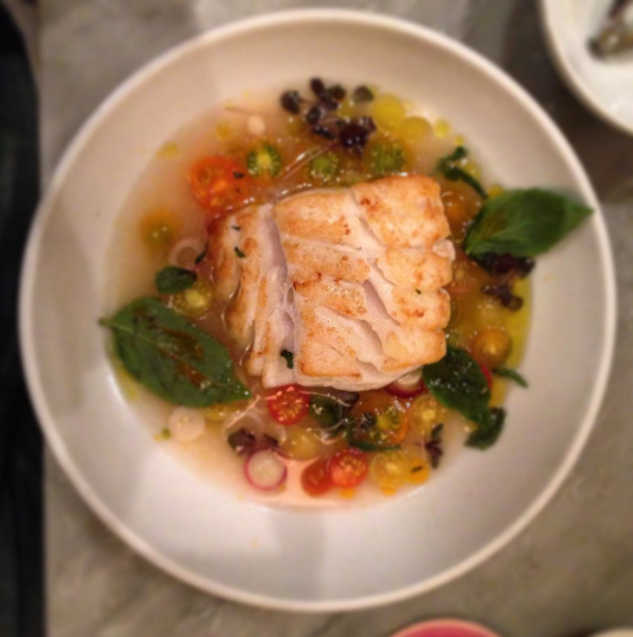 Prune (E 1st & 1st) – When you are feeling a little bit healthy and adventurous Prune is the place to go. I walked by so many times before decided to pop in one evening. I was a little wary when I saw frog legs on the menu, but the halibut the serve is so flaky and delicious, I forgot about the little froggies sitting on the table next to mine. Also, try their steamed clams. I do not know what magical spices and ingredients they use, but every bite is better than the last. What I eat: Steamed Clams, Chopped Salad, Halibut with Cherry Tomatoes. So, I have been blogging about my life, my style, etc. for the past year or two now and after coming back from Miami Swim Week I decided to start a blog about things I do on a daily basis. I spend 9 hours a day looking at swimsuits, researching new designers and when I am not at work I spend it at restaurants, trying new foods, and exploring this wonderful city (NYC). So I decided what the hell, I might as well write about it. Maybe no one will see it, maybe someone will, but I just thought I would document it and highlight things that I find intriguing, delicious and fashionable. Hope you enjoy!